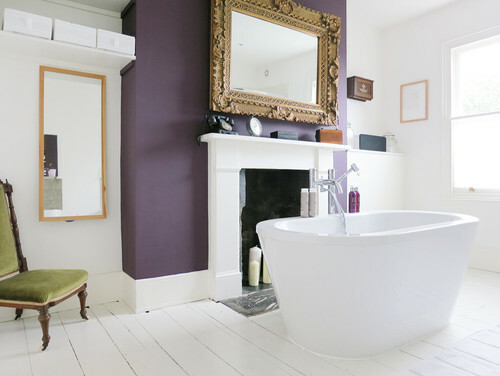 Not Every one would have a bathroom in what seems to be a old bedroom or very large space, However I think incorporating this beautiful colour on a small feature wall in contrast with white bathroom furnishings, would give a calming beautiful feel to your bathroom, a place you can truly relax. 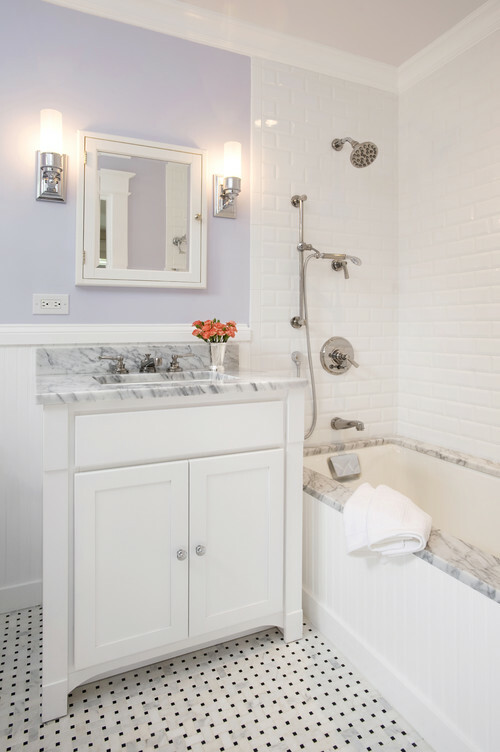 With deep purple be careful not to overpower the room and stick to using it as a feature in your bathroom rather than a full room colour, especially if your bathroom is small. 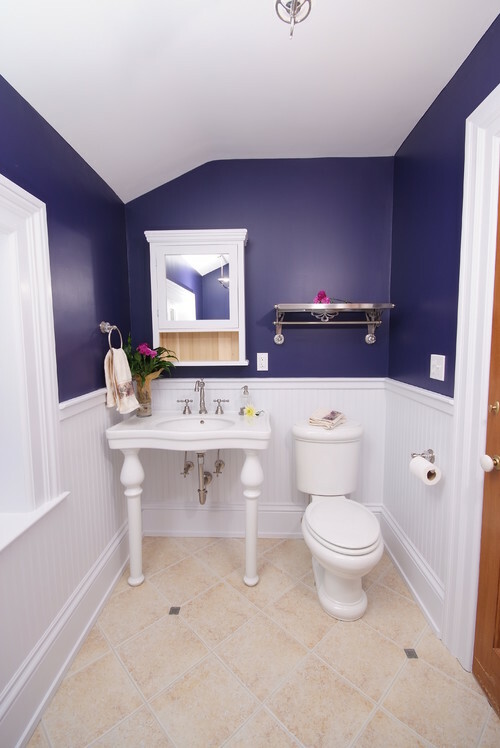 This rich deep purple adds a wonderful calming effect to the room, notice its a reduced saturation purple and not a vibrant heavily saturated colour, the softer shade helps give a feeling of calm and comfort. 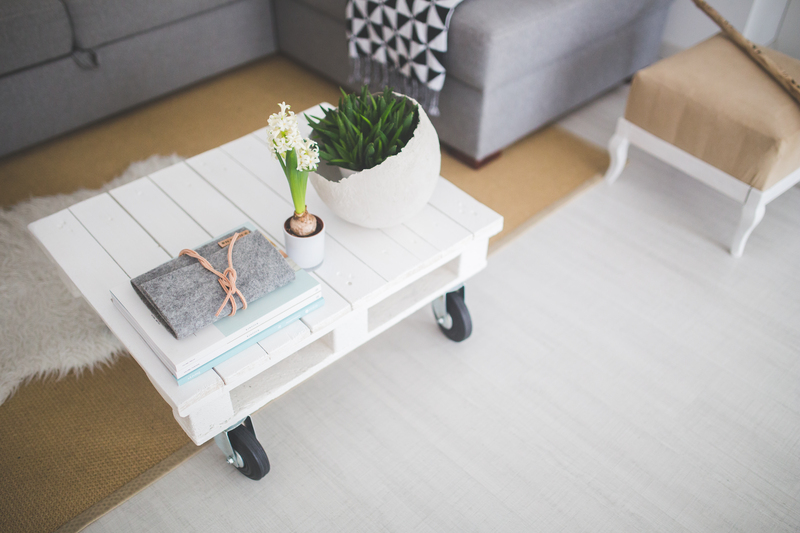 If you prefer Shabby Chic, you could opt for soft Lilac tones, be careful not to go to overboard with Lilac, such as a full wall as it can look very 90's - Try softer greyer tones for full walls, or use one feature wall and pair it with white furnishings. 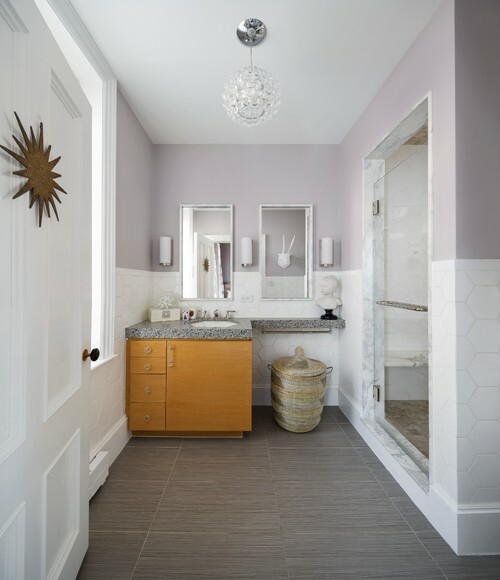 This is an example of a softer lilac shade, with more grey undertones, this is beautiful and can get away with alot more on your walls rather than just a feature wall. 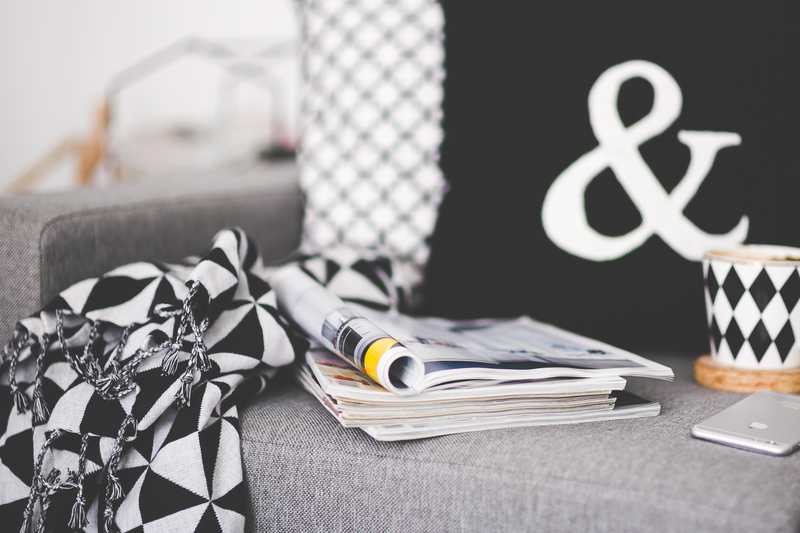 Divide the colour up with white or silver. 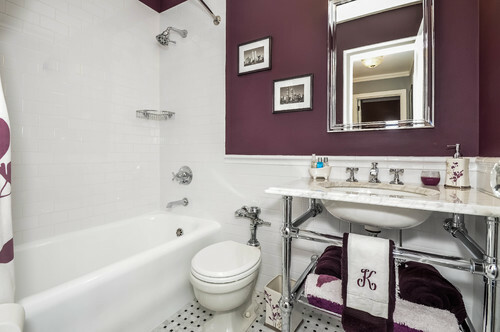 If you wanted to make a bold statement these darker purples can help, be careful not to get a strong saturated purple stick to a more muted deep purple if you are going to paint all your walls, matching these with dark wood furnishing and silver and white accessories can really give your bathroom that glam look. 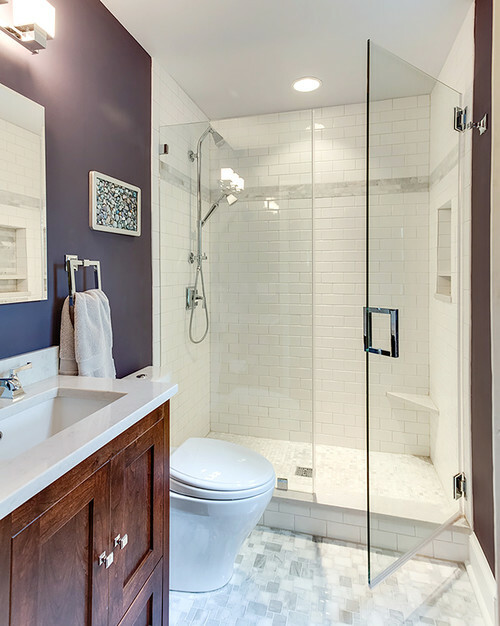 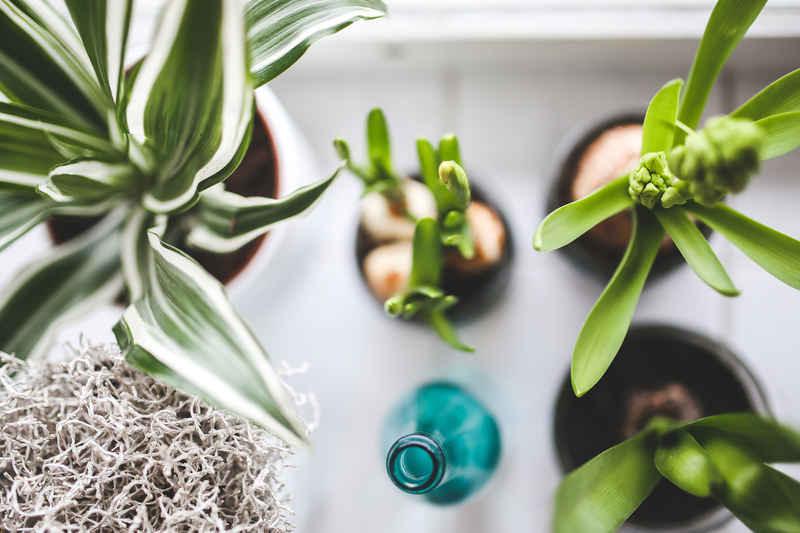 Be careful though, if you have a bathroom with a small window this could really make your bathroom feel smaller and will considerably reduce the brightness. 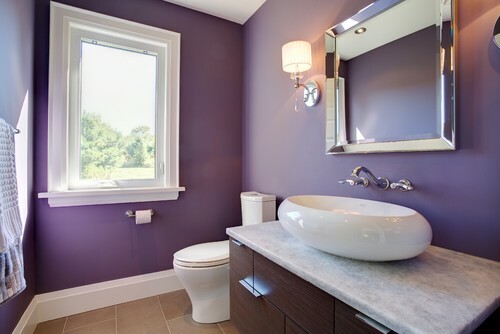 This purple is a very dark Rich purple, and should be used with great consideration, this can either make a bold statement and look fantastic or can really overpower your bathroom space, it is best broke up with contrasting colours such as white, as you can see there is alot of white counterbalancing the deep rich purple be extra vigilant when using this colour, it can look more like a vampires den if you paint your bathroom top to bottom in this rich colour! 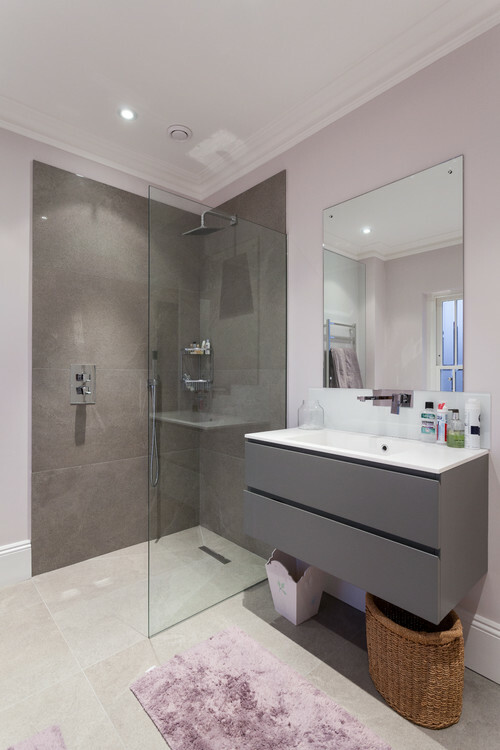 This deep grey and light soft purple works fantastic together, a great way to inject a bit of colour against the grey, be careful with shades get muted de-saturated purples.